This was a long, long, looooong semi-final. It made War and Peace look like a Tweet. It made the Oscars look like a Saturday cartoon. Stars in distant galaxies went through entire lifespans. And still we came no closer to deciding what rumba actually is. All of which would be forgivable if Strictly had treated us to a feast of gripping performances heralding a thrilling battle for final places. Instead, we got a nervy, risk-averse night high on schmaltz, low on entertainment value. After a number of tedious, spot-the-dance routines (rumba? Foxtrot? Rumba again? ), there was a sudden burst of activity from the likely final three: Caroline’s salsa, Frankie’s Argentine tango and Simon’s (saccharine but technically strong) foxtrot. 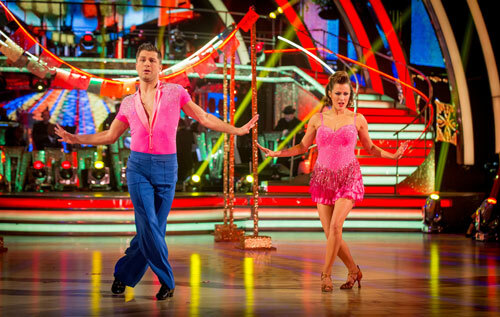 This entry was posted in Dance, Theatre, TV and tagged argentine tango, ballroom, bbc, blurred lines, caroline flack, celebrity, cha cha, competition, dance, dance off, dance today, dancesport, dancing, david lynch, disco, downton abbey, final, finalist, foxtrot, frankie bridge, jake wood, john lewis, judge, latin, len goodman, london, louis smith, magazine, mark wright, oscars, paloma faith, pixie lott, review, rumba, salsa, scd, semi final, simon webbe, strictly, strictly come dancing, the red shoes, tv, twin peaks, twitter, underdog, viennese waltz, vote, winner. Bookmark the permalink.